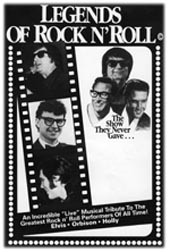 THE LEGENDS OF ROCK N' ROLL show presents the musical history of Roy Orbison, Elvis Presley and Buddy Holly in concert. An incredible "live" tribute to the greatest rock and roll performers of all time. The originator of the Legends show is Les Vogt . Although many shows exist with a similar theme, and some even attempt to trade on the name, it is only THE LEGENDS OF ROCK N' ROLL that carries an international trade mark for performance dates worldwide. 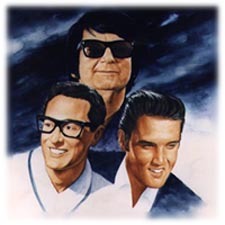 Les created the internationally acclaimed Elvis Elvis Elvis presentation and produced the very successful Labatt's Legends of Rock & Roll series at Expo 86 in Vancouver, British Columbia, which featured forty-two original rockers from the fifties and sixties. 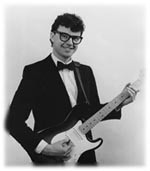 THE LEGENDS OF ROCK N' ROLL show opens with James Player presenting a truly dynamic performance as Buddy Holly. Each of Buddy Holly's records confirms the artist's reputation as one of the most original musicians rock n roll has ever produced. The documentary style of James Player's presentation sets the tone for an evening reliving memories from some of the most charismatic figures in musical history. 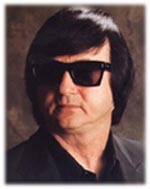 The second show features Larry Branson with what can only be called a stunning portrayal of Roy Orbison in concert. During Orbison's life, he delivered numerous songs that broke the standard songwriting formula and sounded instead like mini-operas. This performance is a wonderful tribute to a compelling career. There was no model for the success of Elvis Presley. What Sam Phillips sensed was something in the air, an inevitable outgrowth of all the country and blues he was recording at his Memphis studio. 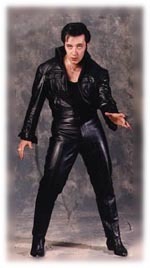 After building for close to two hours, the closing segment of THE LEGENDS OF ROCK N' ROLL show appropriately presents the fabulous Mark Friebe as the king of rock and roll during his Las Vegas years. Finally, the encore set features all the entertainers headlining a rock and roll jam session with the fabulous Legends band. THE LEGENDS OF ROCK N' ROLL tastefully recreates the look and sound of three of the greatest rock and roll performers of all time. The illusion is uncanny. The faces, the costumes, the movements, the songs - they are all the same. You couldn't ask for anything more.